I'm back with something exciting this Monday! 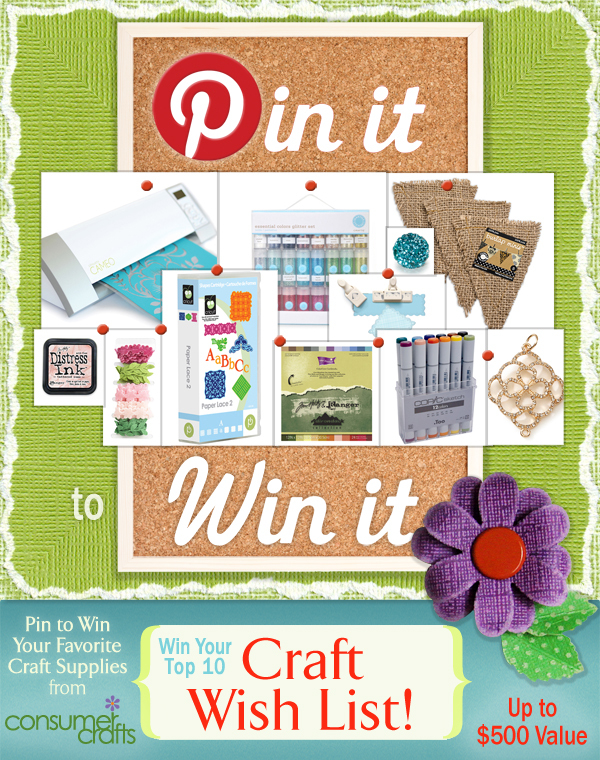 Consumer Crafts is having a fun contest this month involving every crafter's favorite site-- Pinterest! You remember consumer crafts-- that's where I got the yarn to make most of last week's newborn hats. I'm not big on contest and such-- but the prize for this one is $500 in crafting supplies, which I think makes it worth sharing. In addition to traditional paper crafts, they also sell jewelry, kids toys, and organizational supplies; so it will be easy to spend your money! So lets, Pin It to Win It! #spon: I'm required to disclose a relationship between our site and Blueprint Social. This could include the Blueprint Social providing me w/content, product, access or other forms of payment. Pin the top 10 items on your craft wish list for a chance to win up to $500 in craft supplies from ConsumerCrafts! Hurry, Entries must be received by March 31st! I'll be working on my board during the kid's nap today-- I'll post about it on the facebook page when I'm done!